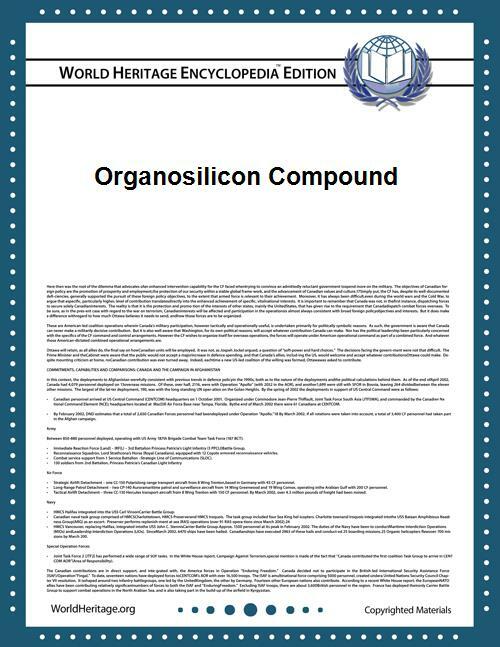 Organosilicon compounds are organic compounds containing carbon–silicon bonds. Organosilicon chemistry is the corresponding science exploring their properties and reactivity. Most organosilicon compounds are similar to the ordinary organic compounds, being colourless, flammable, hydrophobic, and stable. The first organosilicon compound, tetraethylsilane, was discovered by Charles Friedel and James Crafts in 1863 by reaction of tetrachlorosilane with diethylzinc. The carbosilicon silicon carbide is an inorganic compound. Organosilicon compounds are widely encountered in commercial products. Most common are sealants, caulks, adhesives, and coatings made from silicones. Carbon–silicon bonds are however generally absent in biochemical processes, although their fleeting existence has been reported in a freshwater alga. Silafluofen is an organosilicon compound that functions as a pyrethroid insecticide. Several organosilicon compounds are being investigated as pharmaceuticals. In most organosilicon compounds, Si is tetravalent and tetrahedral. Carbon–silicon bonds compared to carbon–carbon bonds are longer (186 pm vs. 154 pm) and weaker with bond dissociation energy 451 kJ/mol vs. 607 kJ/mol. The C–Si bond is somewhat polarised towards carbon due to carbon's greater electronegativity (C 2.55 vs Si 1.90). The Si–C bond can be broken more readily than typical C–C bonds. One manifestation of bond polarization in organosilanes is found in the Sakurai reaction. Certain alkyl silanes can be oxidized to an alcohol in the Fleming–Tamao oxidation. Another manifestation is the β-silicon effect describes the stabilizing effect of a β-silicon atom on a carbocation with many implications for reactivity. Si–O bonds are much stronger (809 kJ/mol compared to 538 kJ/mol) than a typical C–O single bond. The favorable formation of Si–O bonds drive many organic reactions such as the Brook rearrangement and Peterson olefination. Compared to the strong Si–O bond, the Si–F bond is even stronger. A variety of other products are obtained, including trimethylsilyl chloride and methyltrichlorosilane. About 1 million tons of organosilicon compounds are prepared annually by this route. The method can also be used for phenyl chlorosilanes. In the related silylmetalation, a metal replaces the hydrogen atom. Polymers with repeating siloxane linkages are called silicones. Silyl ethers are extensively used as protective groups for alcohols. Organosilyl chlorides are important commodity chemicals. They are mainly used to produce silicone polymers as described above. Especially important silyl chlorides are dimethyldichlorosilane (Me2SiCl2), methyltrichlorosilane (MeSiCl3), and trimethylsilyl chloride (Me3SiCl). More specialized derivatives that find commercial applications include dichloromethylphenylsilane, trichloro(chloromethyl)silane, trichloro(dichlorophenyl)silane, trichloroethylsilane, and phenyltrichlorosilane. Although proportionately a minor outlet, organosilicon compounds are widely used in organic synthesis. Notably trimethylsilyl chloride Me3SiCl is the main silylating agent. One classic method called the Flood reaction for the synthesis of this compound class is by heating hexaalkyldisiloxanes R3SiOSiR3 with concentrated sulfuric acid and a sodium halide. Although this process requires a complex catalyst system and is not catalytic. The polymer PMHS is also used as reducing agents in organic synthesis. Silanylidenes are compounds containing a silicon based chain, joined by a double bond to the main molecule, such as silylidenemethanol. Where it is the main functional group, the molecule is named after the parent silane, with the -ylidene- infix, such as methylidenesilane. Siloles, also called silacyclopentadienes, are members of a larger class of compounds called metalloles. They are the silicon analogs of cyclopentadienes and are of current academic interest due to their electroluminescence and other electronic properties. Siloles are efficient in electron transport. They owe their low lying LUMO to a favorable interaction between the antibonding sigma silicon orbital with an antibonding pi orbital of the butadiene fragment. Certain allyl silanes can be prepared from allylic ester such as 1 and monosilylcopper compounds such as 2 in. In this reaction type silicon polarity is reversed in a chemical bond with zinc and a formal allylic substitution on the benzoyloxy group takes place. Compounds of carbon with other group 14 elements: organosilicon compounds, organogermanium compounds, organotin compounds, organolead compounds. silylenes, the carbene counterparts and silylenoids the carbenoid counterparts. Safety data for methyltrichlorosilane from the Chemistry Department at Oxford University. S. Marsden (Editor): Contemporary organosilicon chemistry. Thematic Series in the Open Access Beilstein Journal of Organic Chemistry.